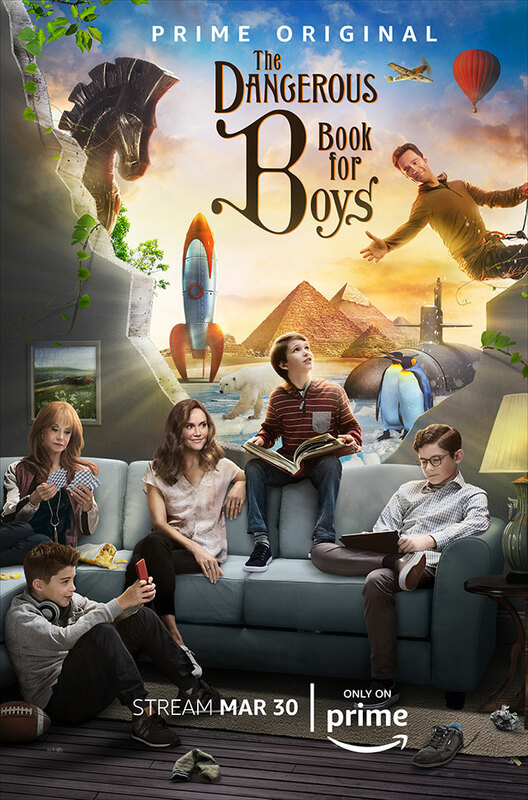 Amazon will premiere all six episodes of their new Prime Original family series The Dangerous Book for Boys on Prime Video on 30th March 2018. The series is based on the book of the same name written by Conn and Hal Iggulden. It’s executive-produced by Bryan Cranston (Breaking Bad), Greg Mottola (Superbad), James Degus (Sneaky Pete) and Michael Glouberman (Malcolm in the Middle). The series follows the McKenna family, as they cope with the untimely passing of Patrick (Chris Diamantopoulos, Good Girls Revolt), their patriarch and a whimsical inventor who positively impacted the lives of everyone who knew him. His death has left the family reeling, but hope appears in the form of a book called The Dangerous Book for Boys that Patrick created as a handbook to help his three sons. The book is a how-to guide for childhood that inspires fantasies for his youngest son, Wyatt (Gabriel Bateman, Lights Out). While in his fantasy world, Wyatt reconnects with his father and learns life skills that help him navigate the real world. The series also stars Erinn Hayes (Childrens Hospital) as Beth, the matriarch of the family who is trying to raise her boys as a single parent. Drew Logan Powell (Rockaway) and Kyan Zielinski (The Lunchbox Brigade) play the other sons, Dash and Liam, and Swoosie Kurtz (Mike & Molly) plays the grandmother, Tiffany. Chris Diamantopoulos plays the role of Terry, Patrick’s twin brother. The Dangerous Book for Boys is an Amazon Studios production with Sony Pictures Television and Moonshot Entertainment. Cranston and Mottola created the series and wrote the first two episodes with Mottola directing whilst Glouberman served as the showrunner.